Home Tags Posts tagged with "greece economy"
Greek parliament has approved the 2016 budget that includes sharp spending cuts and some tax increases amid economic recession. The austere budget was passed with a majority of only eight votes – 153 to 145. “This budget is a difficult task for a government that wants to leave its mark with social justice,” PM Alexis Tsipras told lawmakers. Alexis Tsipras agreed to a batch of economic reforms in August to secure a euro zone bailout of up to €86 billion ($93 billion). His leftist-led government has been under pressure to deliver tangible benefits to its poorest citizens since the agreement. Greece’s budget makes €5.7 billion in public spending cuts including €1.8 billion from pensions and €500 million from defense. It also includes tax increases of just over €2 billion. Despite the cuts, the budget will still have a greater deficit than the 2015 budget. Earlier this year the country reluctantly agreed to the strict conditions of its third international bailout in five years. After losing his majority in August as a result, Alexis Tsipras called an election and was returned to power in September with 35% of the vote. Representatives of the euro zone, the European Central Bank and the International Monetary Fund (IMF) return to Greece on December 7 for more talks about pending reforms of the pension and tax systems and public administration. The euro zone has also held out to Greece the possibility of long-term debt relief after a review of progress under the new bailout. However, it has said that relief would come in the form of longer delays before repayments start or finish, not a reduction – or so-called “haircut” – in the amount that has to be repaid. The Greek government has started the transfer of €750 million ($834 million) in debt interest to the International Monetary Fund (IMF). The move was carried out as eurozone finance ministers met in Brussels in a bid to unlock the final €7.2 billion tranche of Greece’s €240 billion EU/IMF bailout. The eurozone finance ministers said Greece had made “progress” but more work was needed. Greek Finance Minister Yanis Varoufakis said his country faced a cash crisis within a “couple of weeks”. “The liquidity issue is a terribly urgent issue. It’s common knowledge, let’s not beat around the bush,” he told reporters after the talks. The Greek government has until the end of June to reach a reform deal with its international creditors. Its finances are running so low that it has had to ask public bodies for help. Eurozone governments have insisted that Greece agree to economic reforms in return for further bailout funding, and there had been fears that the country could default on its latest IMF debt repayment. 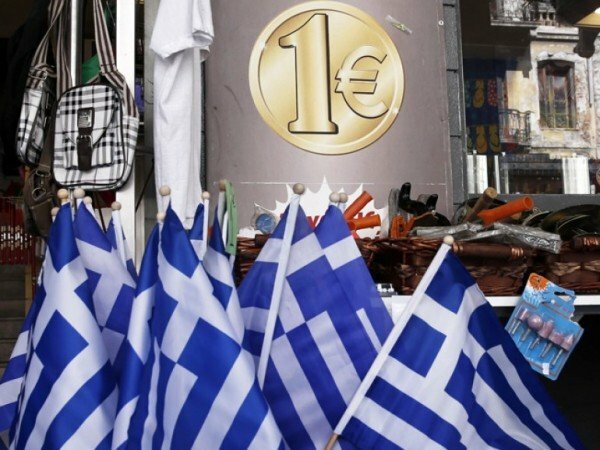 However, a Greek finance ministry official was quoted as saying that the order for repayment had been executed on May 11. Almost €1 billion has been handed over to the IMF in interest payments since the start of May. It is unclear how the Syriza-led government came up with the funds, but the mayor of Greece’s second city Thessaloniki revealed last week that he had handed over cash reserves in response to an appeal for money. No breakthrough was expected in Brussels on Monday, but Greece was seeking a confirmation that it had made sufficient progress in negotiations. It was hoping that part of the EU/IMF bailout money could be paid out and that the European Central Bank would restore liquidity to the country’s beleaguered banks. Eurogroup chairman Jeroen Dijsselbloem said there had to be a full deal on the bailout before Greece received any further payments. Greece is ready to do “whatever it takes” to reach agreement on its bailout in the next two days, Finance Minister Yanis Varoufakis has said. Yanis Varoufakis was speaking after talks with EU finance ministers broke down earlier than expected, with Greece describing the EU’s offer as “absurd”. “I have no doubt that there is going to be a agreement in the end which will be very therapeutic for Greece,” he said. Greece wants the conditions of its €240 billion bailout restructured. Yanis Varoufakis said “within the next 48 hours” Europe would find the phrasing that was necessary to satisfy both Greece and Europe. However, he said there was “substantial disagreement” on whether the task ahead was to complete the current program, which his government has pledged to scrap. 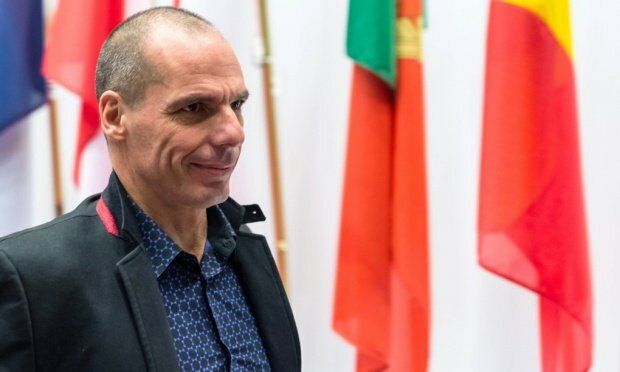 Yanis Varoufakis also said that he had been presented with a draft communiqué which he had been ready to sign, but that it had been withdrawn minutes before the meeting started. The Eurogroup head Jeroen Dijsselbloem also said there was still time for Greece to agree an extension. “There is time and ample room to agree on the terms of an extension. When I listen to my Greek colleagues talking about a bridging loan and so on – that’s a different word for an extension,” said Jeroen Dijsselbloem. He said says another meeting was possible on February 20 but that it was “up to the Greeks”. “My strong preference is and still is to get an extension of the program, and I think it is still feasible,” he told a press conference. Greece’s current bailout expires on February 28. Any new agreement would need to be approved by national governments so time is running out to reach a compromise, without which Greece is likely to run out of money. French Finance Minister Michel Sapin said European leaders needed to respect the political change in Athens. As he arrived in Brussels he urged the Greeks to extend their current deal to allow time for talks. Greece has proposed a new bailout program that involves a bridging loan to keep the country going for six months and help it repay €7 billion of maturing bonds. The second part of the plan would see the county’s debt refinanced. Part of this might be through “GDP bonds” – bonds carrying an interest rate linked to economic growth. Greece also wants to see a reduction in the primary surplus target – the surplus the government must generate (excluding interest payments on debt) – from 3% to 1.49% of GDP. In Greece last week, two opinion polls indicated that 79% of Greeks supported the government’s policies, and 74% believed its negotiating strategy would succeed. Greece has failed to reach an agreement with eurozone officials over the country’s debt crisis, though both sides said there was still hope for a deal. Eurogroup President Jeroen Dijsselbloem said seven hours of talks in Brussels had been “constructive”. They ended without a joint statement to outline procedural steps ahead of further talks on February 16. Greece says its bailout deal with the EU is punitive and must end. The EU has warned Greece to abide by the deal. Greek left-wing government says the conditions of the €240 billion ($272 billion) bailout have impoverished Greece. It was elected on a promise to end the bailout and ease the austerity measures that have accompanied it. The government has proposed to overhaul 30% of its bailout obligations, replacing them with a 10-point plan of reforms. However, Greece’s creditors in the EU, led by Germany, have insisted that the terms of the bailout cannot be altered. Officials from the two sides have been locked in negotiations aimed at reaching a deal on Greece’s debt repayments that would stave off the prospect of its exit from the eurozone – a prospect viewed with fear by the markets. Jeroen Dijsselbloem, who heads the Eurogroup eurozone finance ministers, said after the meeting on Wednesday that there had been no discussion of detailed proposals. “We didn’t enter into negotiations on content of the program or a program, we simply tried to work next steps over the next couple days,” he said. “We had an intense discussion, constructive, covering a lot of ground, also making progress, but not enough progress yet to come to joint conclusions,” he said. Greece’s finance minister Yanis Varoufakis struck an upbeat note, saying hours of emergency talks in Brussels had produced “very good discussions”. 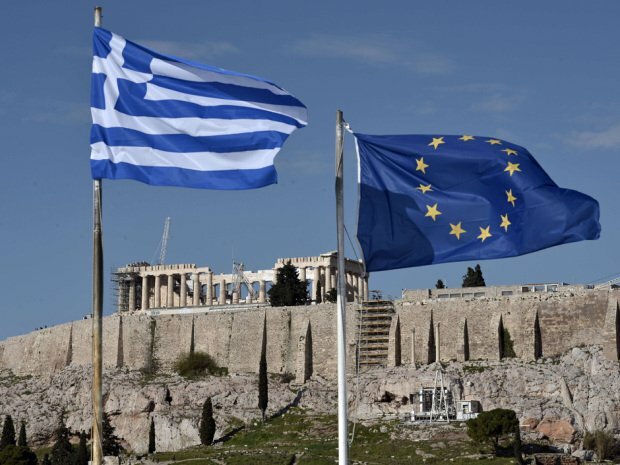 Greek officials had rejected a draft agreement from the eurozone finance ministers that proposed “extending” the current bailout deal, Reuters reported. 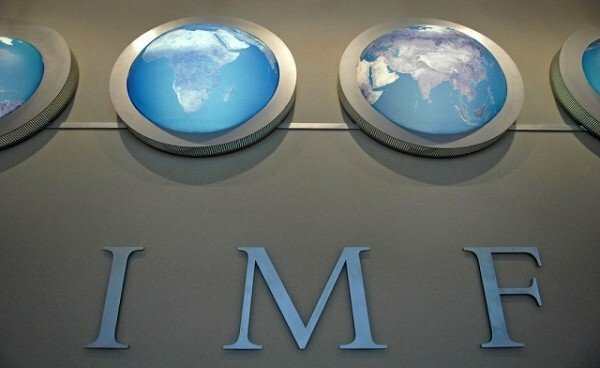 The current EU-IMF bailout for Greece is due to expire on February 28. 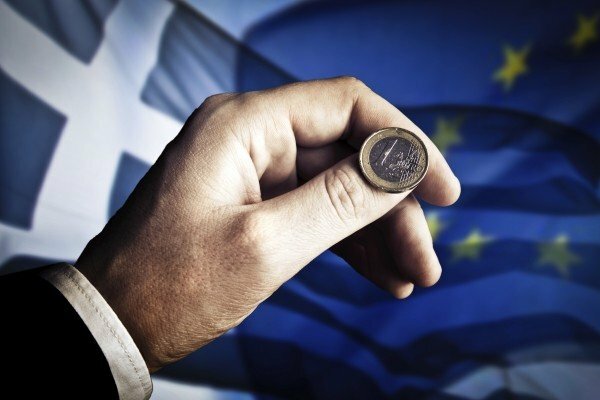 The Greek government rejects the “troika” team – the EU, International Monetary Fund (IMF) and European Central Bank (ECB) – overseeing the bailout’s implementation. It is asking for a “bridge agreement” that will enable it to stay afloat until it can agree a new four-year reform plan with its EU creditors. Greece’s debt currently stands at more than €320 billion – about 174% of its economic output (GDP). On February 11, thousands of left-wing demonstrators rallied in Athens in support of their government’s proposition. The stakes of the talks over Greece’s debt are high because of fears that a Greek default could push it out of the euro, triggering turmoil in the EU. The Greek Defense Minister, Panos Kammenos, previously said Greece might seek funding from Russia, China or the US if it failed to reach a new debt agreement with the eurozone. The Greek government is to present its first concrete proposals for an alternative debt plan at an emergency meeting of eurozone finance ministers in Brussels. Greece’s left-wing government wants to overhaul 30% of its bailout obligations, replacing them with a 10-point plan of reforms. However, EU ministers have warned that Greece must abide by existing terms. The EU-IMF bailout for the debt-laden country expires on February 28 and Greece does not want it extended. Instead the new Athens government is asking for a “bridge agreement” that will enable it to stay afloat until it can agree a new four-year reform plan with its EU creditors. PM Alexis Tsipras’s government won a confidence vote on Tuesday, with the support of 162 deputies in the 300-seat parliament. The Athens stock exchange then fell by more than 3% ahead of the emergency Eurogroup meeting, during which Greece’s new leaders will unveil their controversial debt proposals. Greece’s Syriza-led government says the conditions of the €240 billion bailout – sweeping spending cuts and public sector job losses – have impoverished Greece. It rejects the “troika” team – the EU, International Monetary Fund (IMF) and European Central Bank (ECB) – overseeing the bailout’s implementation. The government’s proposal for overhauling its bailout comes in four parts, according to a finance ministry source widely quoted in Greek media. Under the first part, Greece would co-operate on 70% of its bailout conditions but wants to scrap 30% – replacing it with 10 new reforms to be agreed with the Organization for Economic Co-operation and Development (OECD). It is unclear what these would be. The plan also includes bond swaps to reduce Greece’s debt mountain and a proposal to reduce the primary budget surplus target for this year to 1.49% of GDP, rather than the 3% demanded by its creditors. A swift deal with the EU is unlikely. Most finance ministers, including Germany’s Wolfgang Schaeuble, are insisting that Greece must not renege on its bailout conditions. The Eurogroup ministers will report to Thursday’s EU leaders’ summit but a deal is not expected before the finance ministers meet again on February 16. Greece’s left-wing leaders struck a defiant tone on the eve of the key talks with the EU. The stakes of the talks are high because of fears that a Greek debt default could push it out of the euro, triggering turmoil in the EU. Greece is seeking a bridge loan rather than an extension of its bailout, PM Alexis Tsipras has said. In an address to parliament, Alexis Tsipras also promised measures to cut bureaucratic spending and said his government would stick to all its pre-election pledges. Alexis Tsipras’s far-left Syriza party won elections last month on a promise to end austerity measures. EU officials have rejected his efforts to renegotiate Greece’s bailout terms. 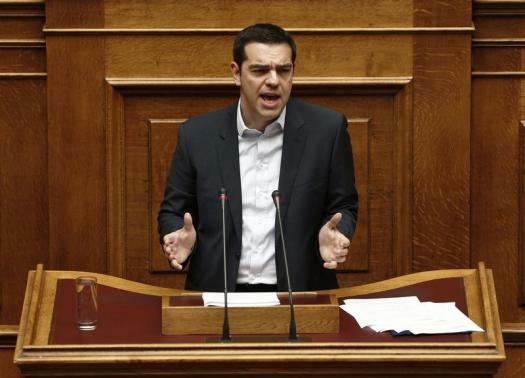 “The bailout failed,” Alexis Tsipras said told parliament on February 8. The prime minister said that Greece wanted to service its debt. “If our peers want so too, they are invited to come to the table of dialogue so we can discuss how to make it viable,” he added. Greece’s current program of loans ends on February 28. A final €7.2 billion is still to be negotiated, but the new government does not want to extend the program and has already begun to roll back austerity measures. Greek debt stands at more than €320 billion, or about 174% of the country’s economic output. In last month’s elections Syriza fell just short of an outright majority and formed a coalition government with the centre-right Independent Greeks. 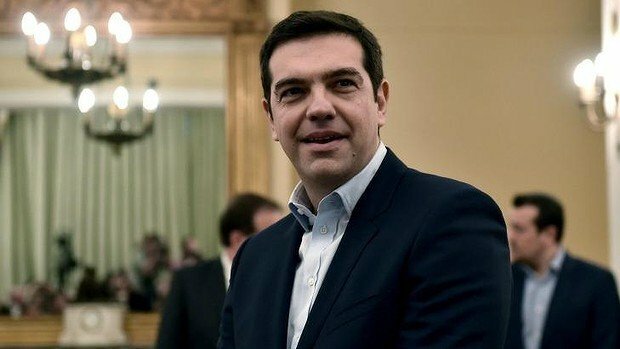 In his speech, Alexis Tsipras said the government’s “irreversible decision is to implement in full our pre-elections pledges”. The first priority, he said, was “tackling the big wounds of the bailout, tackling the humanitarian crisis”. That includes giving free food and electricity to those worst affected by the economic crisis, and ending an unpopular annual levy on private property. creation of a new national broadcaster. cutting ministry cars and government planes. Alexis Tsipras also repeated demands that Germany pay reparations for World War Two and repay a loan that the Nazis forced the Bank of Greece to pay when they occupied Greece. Greece had “a moral obligation to our people, to history, to all European peoples who fought and gave their blood against Nazism”, Alexis Tsipras said. Greece’s new PM Alexis Tsipras has said he is confident that agreement can be reached with creditors over repayment of his country’s debts. Alexis Tsipras said in a statement issued to Bloomberg news agency that he had never intended to act unilaterally. 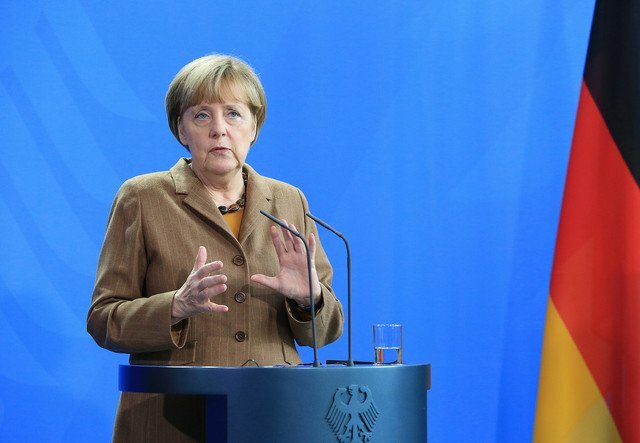 This week, German Chancellor Angela Merkel has ruled out debt cancellation, saying creditors had already made concessions. Alexis Tsipras’ Syriza party won last weekend’s election with a pledge to have half the debt written off. 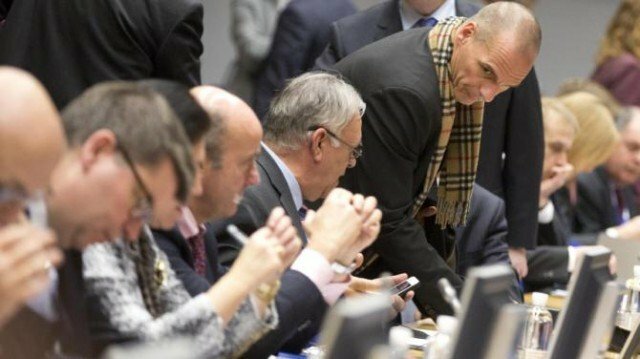 Its new Finance Minister Yanis Varoufakis has refused to work with the “troika” of global institutions overseeing Greek debt, which had agreed a €240 billion ($270 billion) bailout with the previous Greek government. The troika is made up of the European Commission, European Central Bank and International Monetary Fund. Greece still has a debt of €315 billion – about 175% of gross domestic product – despite some creditors writing down debts in a renegotiation in 2012. Alexis Tsipras said Greece would repay its debts to the ECB and IMF, and reach a deal with the eurozone nations that funded most of the bailout package. “The deliberation with our European partners has just begun,” he said. Jeroen Dijsselbloem, chairman of the eurozone finance ministers’ group, said he welcomed Alexis Tsipras’ comments. “It is now up to the Greek government to determine its position on how to move forward,” he said. In interviews in the German media published on Saturday, Angela Merkel said she still wanted Greece to stay in the eurozone but did not “envisage fresh debt cancellation”. “There has already been voluntary debt forgiveness by private creditors, banks have already slashed billions from Greece’s debt,” she told Hamburger Abendblatt. Greece’s current program of loans ends on February 28. A final bailout tranche of €7.2 billion still has to be negotiated but the new government has already begun to roll back austerity measures. Greece’s new Finance Minister Yanis Varoufakis says his government will not negotiate over the Greek bailout conditions with the “troika” team from the EU and IMF. The minister was speaking after meeting Jeroen Dijsselbloem, head of the Eurogroup – the eurozone finance ministers. Jeroen Dijsselbloem said Greece should stick to its reform commitments. He said Greece and the Eurogroup had a “mutual interest in the further recovery of the Greek economy inside the eurozone” and warned against Athens acting unilaterally in its efforts to renegotiate its bailout. Greece has endured tough budget cuts in return for its €240 billion ($270 billion) bailout, agreed in 2010 with the “troika” – the European Commission, International Monetary Fund (IMF) and European Central Bank (ECB). There was little warmth between the two men at the news conference, with Jeroen Dijsselbloem making a brusque exit. Breaking with tradition, Yanis Varoufakis wore an open-neck shirt – hanging loose at his belt. 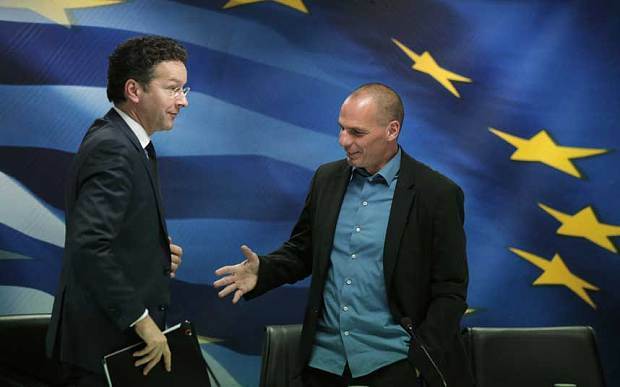 Jeroen Dijsselbloem was dressed conventionally. Jeroen Dijsselbloem, who is also Dutch Finance Minister, said the two sides would decide what would happen next before the bailout program ends – that is, by February 28. He also met Greek PM Alexis Tsipras in Athens, who led the Syriza radical left-wing coalition to victory in elections on Sunday. Yanis Varoufakis, meanwhile, said Greece was not asking for an extension of the existing bailout, but seeking a “new agreement that will emerge following talks between all Europeans”. He said he would he seek “maximum co-operation” with Greece’s international creditors, but that he would not work through the “troika”, which he called “a committee built on rotten foundations”. 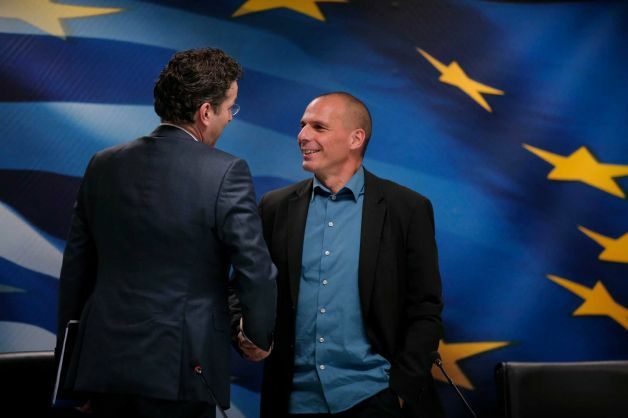 Jeroen Dijsselbloem rejected Alexis Tsipras’s idea of convening a European conference on debt. “This conference already exists and it’s called the Eurogroup,” he told the news conference. Syriza won on an anti-austerity platform, promising to have half of Greece’s debt written off, and to roll back on deep cuts to jobs, pay and pensions. Greece’s economy has shrunk drastically since the 2008 global financial crisis, and high unemployment has thrown many Greeks into poverty. The new government has already pressed ahead with cancelling major privatization projects, including of the two main ports of Piraeus and Thessaloniki. Greece has about €20 billion ($22.5 billion) to repay this year, according to the Greek finance ministry. Economists estimate that Greece needs to raise about €4.3 billion in the first quarter. Ahead of his visit to Greece, European Parliament President Martin Schulz says he will use “straight talking” in his first meeting with Alexis Tsipras’ government. 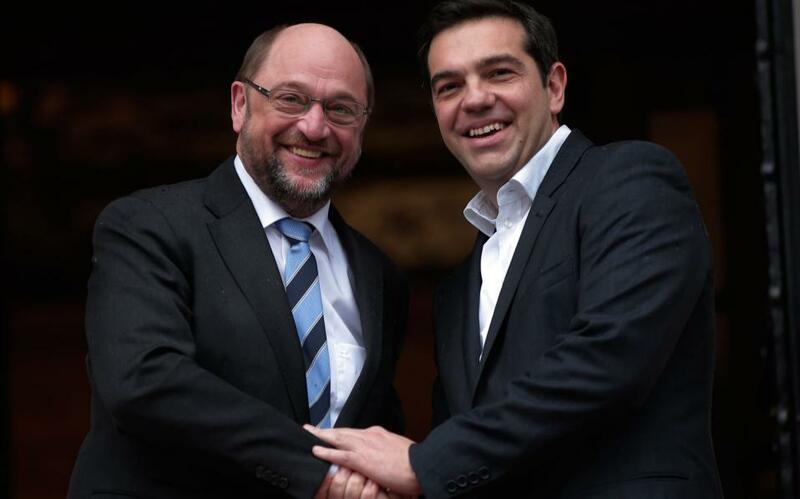 Martin Schulz’s visit to Athens comes amid concerns over steps by PM Alexis Tsipras to halt austerity measures. Greek bank stocks edged back up on January 29 a day after dipping sharply as the government shelved privatization schemes required under bailout terms. European leaders have insisted Greece must meet its debt obligations. Alexis Tsipras has said he wants to renegotiate the terms – but insisted there will be no Greek default, which is feared may push Greece out of the eurozone. 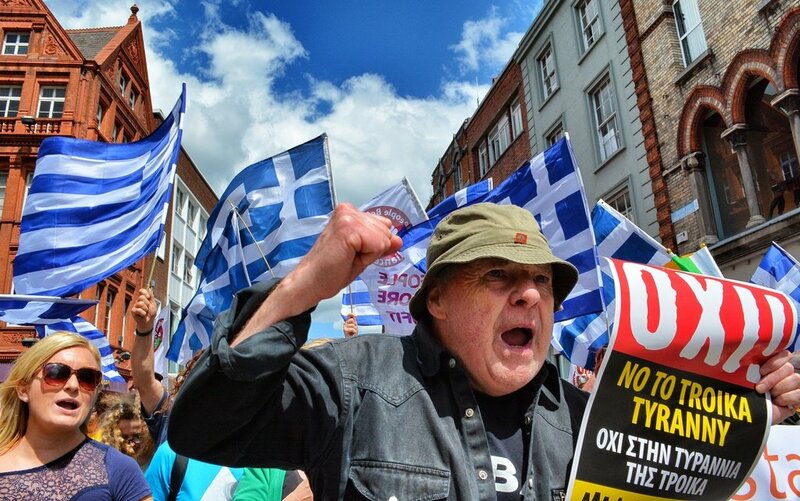 Greece has endured tough budget cuts in return for its €240 billion ($270 billion) bailout, negotiated in 2010 with the “troika” – the European Union, International Monetary Fund (IMF) and European Central Bank (ECB). Ahead of his visit, the European Parliament president told Germany’s Bild newspaper he would encourage Alexis Tsipras to clamp down on tax evasion in Greece. However, Martin Schulz he said he would focus on “straight talking” and had “no desire” to debate fiscal plans. Germany’s Vice-Chancellor Sigmar Gabriel also reiterated the need for Greece to respect the terms of its bailout on Thursday. Speaking in the German parliament, Economy Minister Sigmar Gabriel said the new Greek government could not expect the rest of Europe to carry what he called their “burden”. “People must respect the democratic decision of voters and a newly-elected government’s right to decide its course but the rest of Europe’s citizens should not have to expect changes in Greek politics to burden them,” he said. Jeroen Dijsselbloem, the president of the Eurogroup club of eurozone finance ministers, will visit Athens on January 30. Ahead of the dignitaries’ trips, European Commission President Jean-Claude Juncker reiterated that cancelling Greece’s huge debt was not an option. “Greece must comply with Europe,” Jean-Claude Juncker said in an interview with French newspaper Le Figaro on January 29, stressing that “there is no question of cancelling the debt”. In his first cabinet meeting since Syriza’s election victory, PM Alexis Tsipras insisted that his country would not default on its debts and vowed to negotiate with creditors over the bailout. The Athens Stock Exchange fell by 9% in response to Alexis Tsipras’s remarks on January 28 as it emerged that his Syriza-led government was putting on hold major privatization projects, including the port of Piraeus and the main power company, the Public Power Corporation of Greece. Greek stocks rebounded on January 29, with the National Bank of Greece up 6.7% and Alpha Bank up 11.8%, according to Reuters.